The main goal of Google is to hold the maximum of viewed adverts on the net, and gain huge amount of money. Till now, ads are only shown as small links with some text. And the context intelligently matches user interests. But, will google in the future, only rely on such type of incoming ? My answer is simply : NO ! First step after acquiring Youtube is to play video ads before launching mostly viewed sequences, also put some intelligent context matching text ads somewhere. There is dailymotion and he already doing that. But if we rethink another service that only google holds its sources, the GoogleStreetView ! Google Street View is a very helpful service provided by Google for free and for everybody. 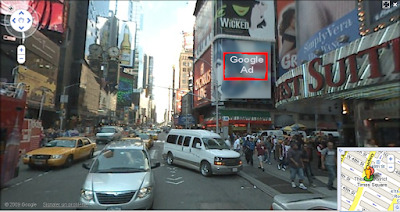 Google can simply use some algorithms to detect the ad places in a street view, the orientation the deformation, and replace these zones with Google related stuff. As explained in the photo, it won't be a difficult thing to be coded by the Mountain View team, and it will be a "Google only" stuff difficult to be reproduced in resonable time by other competitors. And of course, it will be a colossal source of money. I really wish you "Don't be evil" Google !